The Calheta municipality, home to close to 12 thousand people, is located between the southern and western end of the island of Madeira, and its area of approximately 116 Km2 makes it the longest of the Autonomous Region of Madeira. 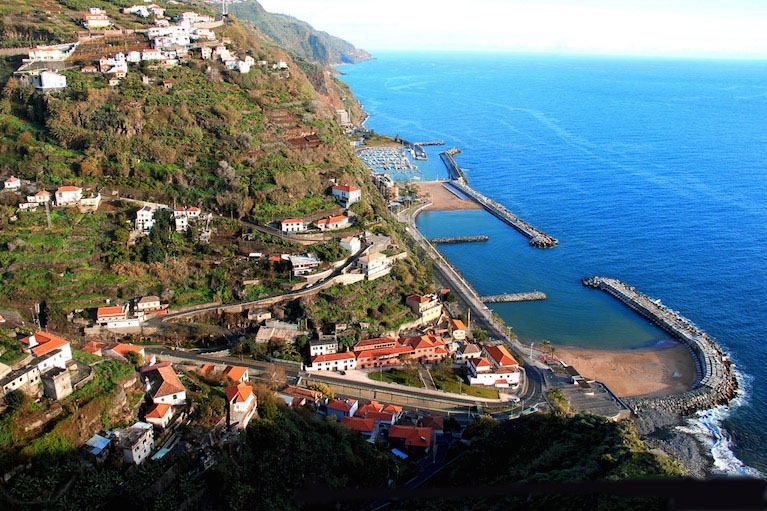 It is thought that the origin of the name derives from the small bay or cove, which serves as its port, where Zarco entered when he intended to go ashore, because this is the meaning of Calheta. This locality houses the Arts Centre “Casa das Mudas”, a project designed in complete harmony with the surrounding landscape, which features a wide cultural offer. “Casa das Mudas” holds exhibitions of various kinds, plays, musicals, conferences and many other events. The municipality of Calheta has eight parishes: Arco da Calheta, Calheta, Estreito da Calheta, Fajã da Ovelha, Jardim do Mar, Paul do Mar, Ponta do Pargo and Prazeres. Ponta do Pargo Lighthouse: Erected at Ponta da Vigia, 290 metres above sea level, the Ponta do Pargo lighthouse was first lit on 5th June, 1922. Dominating the top of the cliff, the tower is 14 metres high and its light is at an elevation of 312 metres above sea level. ​Art Gallery of Prazeres: Dedicated to the promotion and diffusion of Plastic Arts, the Gallery of Prazeres emerges in rural environment, joining a project created to develop cultural traditions in the local population. Sugar Cane Factory: With a history dating back half a century, here you can find some of the oldest sugar cane mills on the island of Madeira. The Calheta Milling Company was founded during a period of great industrial development during the second sugar boom at the end of the 19th and beginning of the 20th century. It is a living example of the sugar production of the past, with half a century of history, as it is one of the oldest mills on the island of Madeira. Casa das Mudas Arts Centre: Designed by architect Paulo David, Casa das Mudas Arts Center, has received international awards for its architecture and seamless integration into the landscape and hosts various exhibitions, musical performances, plays and lectures. This Arts Center has a covered construction area of 12,000 m² and was built as an extension to the existing Calheta Culture House, where the "Gallery" currently operates. Calheta Beach: The artificial yellow sand beach of Calheta village was opened in 2004. Calheta was, in fact, the first town in Madeira to have an artificial beach, and also features a sunbathing area of about 7,300 m2. Miradouro do Piarro: Situado no cimo da encosta sobranceira à praia da Calheta, deste ponto se observa a praia, a marina da vila e o Centro das Artes Casa das Mudas. Paúl do Mar Beach: This peaceful beach is also known as Ribeira das Galinhas beach. It is regarded as one of Europe’s best surf beaches, hosting one Billabong Challenge and a National Surf Championship in 2000. Santo Antão Viewpoint: Located on the cliff top of Achada de Santo Antão, it has a superb view over Madalena do Mar and Calheta. Mother Church of the Holy Spirit: Building from the late fifteenth century, classified as a heritage building that retains rich artistic, religious and architectural features. ocated in the village of Calheta, the Igreja Matriz do Espírito Santo was built in the late fifteenth century and completely rebuilt in 1639 in a Manueline and Mannerist style. Hotel Calheta Beach ****: Overlooking the Atlantic Ocean, this hotel is situated on the sandy Calheta Beach. It features indoor and outdoor pools, a spa and a gym. Each room has a private balcony. All rooms and apartments at Calheta Beach offer mountain or sea views. Saccharum Hotel Resort & Spa ****: A luxurious 4-star design hotel sitting on Calheta Beach, between Madeira Mountains and the Atlantic Ocean, Saccharum Hotel Resort & Spa features a rooftop infinity pool and conference rooms.